UK: Siemens will supply five 6MW turbines to the 30MW Hywind Scotland floating offshore project, which is being developed by Statoil. The turbines will be installed on Statoil's floating foundations at a site 25km off the Scottish east coast. Statoil said it would build the project in November, after it received the final marine licence from the Scottish government. The Hywind floating foundation is a spar-based design, made up of a steel cylinder filled with ballast. It extends around 100 metres below the surface and is attached to the seabed by a three-point mooring. The five turbines will be installed at a site with water depths of 95-120 metres. 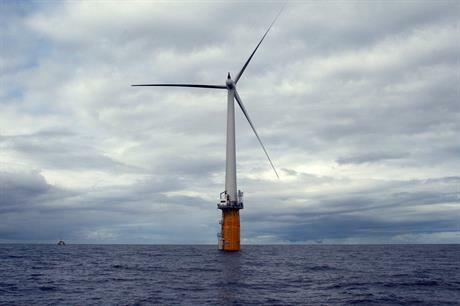 Siemens previously supplied a 2.3MW turbine to the Hywind Demo project installed in 2009 off the coast of Norway. The German manufacturer said it collected a lot of information on the requirements for control parameters for a moving wind turbine under offshore conditions at the Hywind Demo site. "For the floating installation Siemens' technicians developed new controller settings for rotor pitch and yaw drive regulation," the company said. Also in November, Scottish engineering firm Isleburn won the contract to provide suction anchors to the project.